I’ve been making homemade treats lately for the pups in our family and I have yet to find any they have refused, turned up their wet noses and demanded they be sent back to the kitchen. 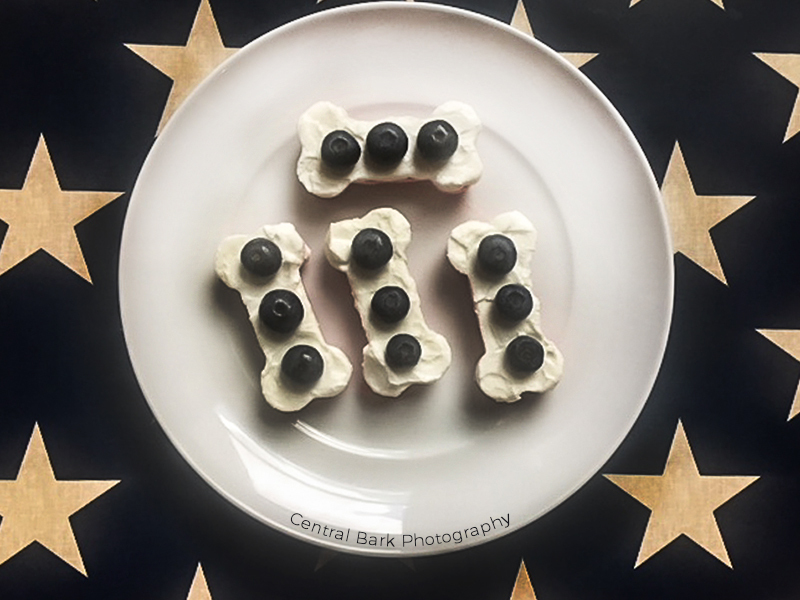 With the 4th of July holiday approaching, I wanted to make some red, white and blue dog treats so they could celebrate the festive summer holiday too! 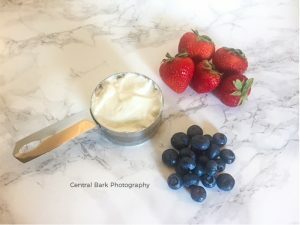 After searching for some dog-friendly foods in the appropriate red, white, and blue colors, I collected the ingredients including berries and non-fat plain Greek yogurt. Besides being tasty, these items also have added health benefits for the pups! Strawberries and blueberries offer antioxidants and fiber while strawberries also are packed with vitamin C. Greek yogurt has concentrated probiotics which are the good bacteria that can aid in helping recurring ear and skin problems caused by yeast infections. Yogurt is not however good for pets who are lactose intolerant. 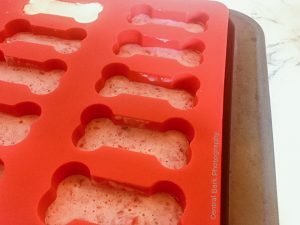 But if your dog is ok with a little dairy, then they will probably love these patriotic frozen treats! Because I layered these treats, I started with the strawberry layer on the bottom. I added the strawberries and approximately 1/3 cup Greek yogurt to a blender and pureed the mix. I then took a bone-shaped silicone baking mold and placed it on a small cookie sheet. The cookie sheet provides support and a flat surface for transporting and freezing the treats since the mold is a little floppy when handled. I poured the strawberry yogurt mixture into each mold, filling it approximately half way. I then placed them into the freezer to freeze overnight. The next morning, I removed the frozen treats from the freezer and added the rest of the Greek yogurt on top of the strawberry layer. I then placed those in the freezer for a few more hours to completely freeze. When they were frozen solid, I took them out of the freezer and I actually used a small amount of Greek yogurt on the top as sort of an icing and placed 3 blueberries on the top. You could also place the blueberries on top after layering the Greek yogurt and freeze them together. The pups were super excited to try these new treats. I popped a couple of treats out from the molds and set them out on a plate for the pups to try. With smiling faces and wagging tails, I think these were a hit! I’m sure they would be much happier if I didn’t limit them to only one or two treats per day. I kept a close eye on them after giving them the treats since they were frozen and I used fruits rather new to their diet. When giving your pets new treats, it is recommended to supervise them and watch for any negative allergy or temperature tolerances. If you are unsure about your pet’s health and diet, please consult with your veterinarian for appropriate foods before giving them anything new to try. Speaking of July 4th, did you know that more pets end up in shelters during the Independence Day holiday than any other time of year? The holiday, full of colorful fireworks and loud bang noises, causes stress on pets who are unfamiliar with the sounds. Dogs left outside will try to escape the scary sounds by bolting over and under fences and running as far as they can to get away. I found this great article that includes tips to help calm your pets and prepare them for the festivities here. Want to find more dog-friendly recipes? Come over and join Central Bark Photography as we search for some dog-gone-good dog treats on Pinterest. 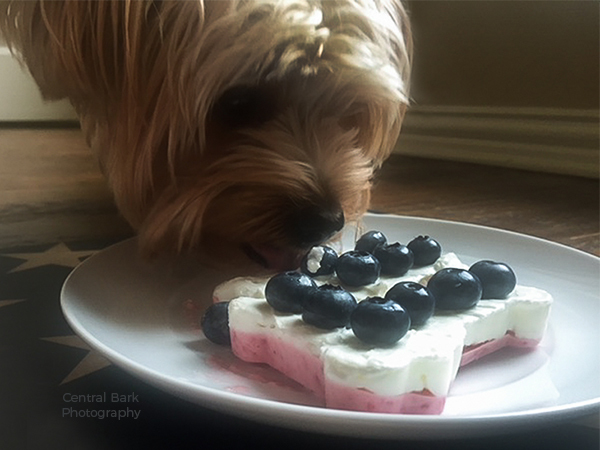 * This post contains an affiliate link to provide you with a quick link to products tried and recommended by the Central Bark Photography team. Freddy trying his patriotic treats. Excuse the blurry iPhone photo!